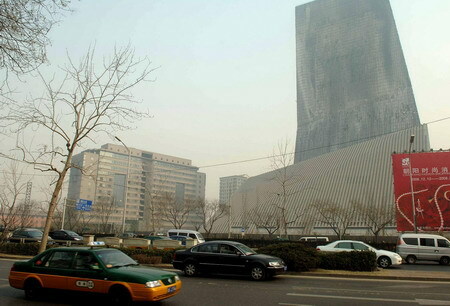 BEIJING -- Another five people have been detained in relation to a massive fire at the controversial new headquarters of China Central Television (CCTV) earlier this month in Beijing, local police said Thursday. They were investigated for illegally transporting a large amount of banned fireworks into Beijing, a spokesman with the Beijing Municipal Public Security Bureau said. Fireworks were blamed for causing the fire. Among the five suspects were drivers in charge of transportation, guides in charge of bypassing highway police checkpoints and middlemen in charge of finding a fireworks company to ignite the fireworks, the spokesman said. The fire on the night of February 9, involved a 30-story building which housed the nearly-completed luxury Mandarin Oriental Hotel, part of the new headquarters of the state television network, in Beijing's Central Business District. A fireman died and seven people, including six firemen and a construction worker, were injured in the blaze. CCTV hired a company to ignite several hundred grade A fireworks outside the hotel that night for the traditional Chinese Lantern Festival which marks the end of Lunar New Year celebrations. Fireworks were allowed in downtown Beijing until midnight during the Spring Festival, but powerful grade A fireworks must be ignited with police approval. According to the Beijing Fire Control Bureau, CCTV failed to get the police permit. It even ignored warnings from officers for it to cancel the fireworks show. On February 11, Beijing police detained 12 suspects in connection with the blaze, including four CCTV staff members and eight people CCTV hired from a fireworks company in central Hunan Province to set off the explosives. They were accused of "causing an accident with dangerous articles." Xu Wei, CCTV's deputy chief engineer who was in charge of construction of the new headquarters, was among those detained.